"Williams College" is embossed in gold across the bottom of the matte on all of our beautiful diploma frames. 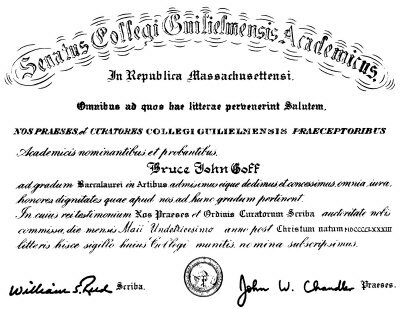 This embossing is important because actual Williams College diplomas contain only the latin equivalent ("Senatus Collegi Guilielmensis Academicus") and do not say "Williams College" anywhere. All of our diploma frames use museum quality, acid-free materials and include easy mounting instructions. There is an $18.95 charge for diploma frame shipping. Our website may not always offer the correct shipping charge. Since all charges are processed manually by Williams Shop staff, please be assured that you will be charged the correct amount for shipping. Thank you! Now you can even design your own diploma frame online by simply clicking on the link below. Design your own frame online! Diploma frame with Premier moulding and black linen matte with gold wood fillet. Diploma frame, Kensington moulding, satin finish. Diploma frame, Signature moulding, satin finish. Diploma frame, Gallery moulding, gloss finish. Diploma frame, black onyx moulding, high-gloss finish. Diploma frame with Cambridge moulding and black and purple matting. Diploma frame, Williamsburg moulding, satin finish. Diploma frame with Chapin Hall scene, Galleria moulding, gloss finish. Diploma frame, Gallery moulding, gloss finish, purple matting. Diploma frame, Madison moulding, gold medallion of the Williams College seal, purple suede matting.